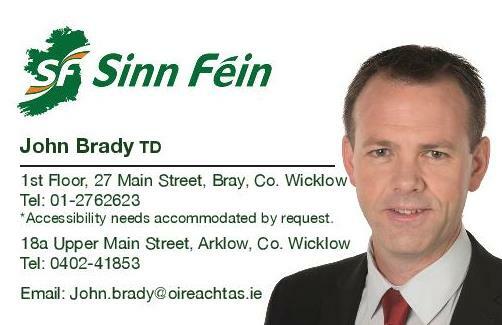 Sinn Féin TD for Wicklow/East Carlow John Brady has urged people to attend an upcoming public meeting to voice concerns for the urgent need for works to be carried out on the N81. 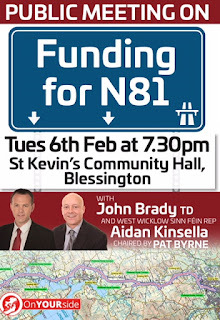 The public meeting will take place on Tuesday next February 6th in St. Kevin’s Hall in Blessington at 7.30pm. “I was recently informed that the N81 from Tallaght to Hollywood Cross road improvement scheme is currently suspended and that the project is not included in the Government’s Capital Investment Plan which provides the financial and strategic framework for Transport Infrastructure Irelands activities until 2021. Therefore, the N81 is now not included in the national roads programme. “The plans which have been worked on now for 10 years would have seen an upgrade of 31km of the N81, with a focus on improving the road safety and journey times for motorists using the road. After extensive public consultation a preferred route has been selected and a 300 metre wide corridor along the route has been frozen from any other development. 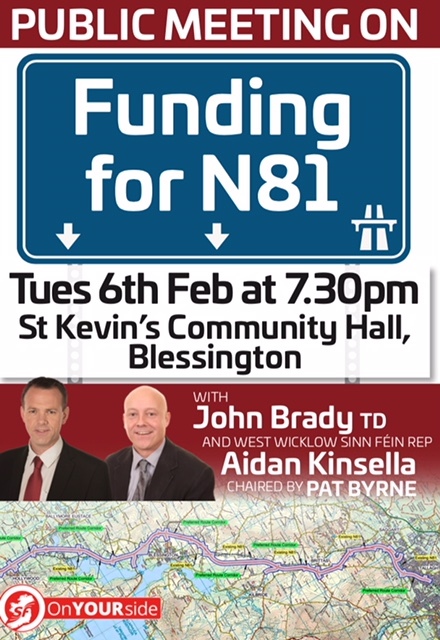 “I have been lobbying Minister Shane Ross on the urgent need for works to take place on the N81. Locals and those familiar with the N81 will know it is one of the deadliest roads in the County. According to a briefing report which was released by the Kildare National Roads Office, the current N81 between Tallaght and Hollywood Cross has up to seven times the national average of head-on collisions, and two times the national average of single-vehicle crashes.